Home	/ Musings / A dream come true! Yesterday was a very special day for all of us at SVYM – the inauguration of our new facility ‘Sadhana’ at Mysore. We have been celebrating Swami Vivekananda’s 150th birth anniversary in several unique ways and the dedication of this building to his memory was one of them. It is here at ‘Sadhana’ that we will strive to build leaders for a Resurgent India. Apart from this commemorative function, yesterday was special for more reasons than one. The dignitaries we had invited were people who have done so much for humanity in their own ways. Apart from supporting us through our 29-year history, they also symbolize the growing mass of goodness. His Holiness Sri Shivarathri Deshikendra Swamiji of the JSS Math needs no introduction. Apart from running hundreds of educational institutions, the JSS group is very progressive and is involved in a large number of social development initiatives. Swamiji has always responded to all our invitations and we were indeed blessed to have his presence amidst all of us. He inaugurating ‘Sadhana’ was indeed very significant for all of us. 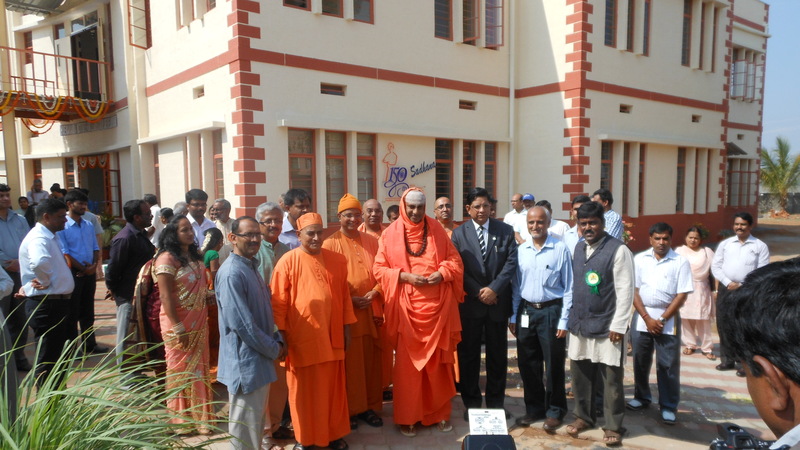 The Ramakrishna Ashram and the monastic members of this order have been with us ever since our inception. Swami Goutamanandaji Maharaj was the key person who not only helped us shape our dream of a Leadership Institute into concrete reality, but also spoke to the Supraja Group to secure their assistance and support, many years ago. His presence today was more than just mere sentiment. Being a respected monk and a Trustee of the Ramakrishna Mission, his blessings was something that all of us counted as special and morale-boosting. Despite his age and hectic schedule, he made this trip specially for us from Chennai and was very happy to inaugurate ‘Kaivalya’ – the center for reflection and contemplation. He promised to spend some meditative time here when he comes to Mysore next. Many years ago, I was impolitely turned away from a major nationalized bank that was then located on Devaraj Urs Road in Mysore. I had chosen to open an account there as it was mid-way between my hostel and medical college. Unfortunately, the discourteous behavior of the manager and the staff there left me looking for another bank to open an account for the organization. I was lamenting about this experience with Lion M S Nanjundaswamy, one of our early donors and supporters. He immediately spoke to the manager of Canara Bank, Jayalakshmipuram branch where he had his accounts and requested that they open an account for us. That is how we first got ourselves associated with Canara Bank. From then it has been no looking back. Whether it was the early managers like Mr Srinath (who is now one of our advisers) or Mr Nayak (our member Dr Mridula Nayak’s father) or Mr Tukaram Prabhu or the current generation of managers – each one has been impressive with their service and support to SVYM and its activities. My own early experiences of the support received from Mr S R Prabhu (of the Canara Bank Relief & Welfare Society) and Mr Seetharam Prabhu (who was incharge of their Jubilee Fund and the Chairman of the Kalpatharu Grameena Bank later) has already been written by me. The bank’s support through the Society for the first classroom of VTCL, the support for the ward at Saragur and now the support for the Library at V-LEAD are all indicators of their continued partnership. But for the bank’s trust in us and the loan that they extended, V-LEAD’s hostel and ‘Sadhana’ would never have materialized. It is indeed a matter of pride and privilege that we had the Chairman & Managing Director of Canara Bank, Mr R K Dubey with us to inaugurate the ‘Canara Bank Library Hall’ and a new ATM facility at our hostel premises. This ATM was another record for us. Ramesh Kikkeri and his team built the outer shell from pre-fabricated materials in two weeks time and the Canara Bank team made it into a fully functional ATM facility within the past 5 days. I must also mention that Mr Dubey in his earlier role as the Managing Director of Central Bank of India had made a donation for building one of the project offices within ‘Sadhana’. The presence of Justice M N Venkatachalliah would have added more lustre to this already illustrious dignitary list. Unfortunately, he could not return from Delhi where he had gone to attend the Sarvodaya International Board meeting, of which he is the Chair. His blessings continue to be with us in all that we engage in. The people in the audience were another special reason to celebrate. Our donors, well-wishers, former employees, families of staff members, many SHGs and CBOs that we have supported, the students of Vidyakiran program and their parents – all of them were present in large numbers. We had anticipated 750 people, but had more than 900 attending and cheering us on. Many of them called or spoke to me telling me how different this function was. Each one of them mentioned an unexplainable feeling of calmness, energy and inspiration there. All the members of the SVYM family participating further reinforced this spirit of engagement. It was wonderful to see the spirit of togetherness. We did miss Dr Seetharam, who had to be in New Delhi to represent SVYM and receive the ICICI Lombard & CNBC-TV18 India Healthcare Award. This award was given to us for running the best program that addressed key social determinants of Primary Health Care. This function could not have turned out this way but for the participation of the many who quietly labored the last many weeks. My special thanks to each one of them. The function also gave us an opportunity to thank seven special people who helped shaped our idea of ‘Sadhana’ into an actual building. The structural engineer Mr Raghunath had drawn up the structural design for the building designed by Ms Tara Murali. But for N R Ashok, another expert in concrete and structures who gave us the confidence and the expert counsel, we would never have ventured into all the innovations that we have tried out in this building. Koushik, the contractor also joined hands in delivering the building, though I must confess that we did have our tough moments in agreeing to difficult deadlines. We could complete the construction of this building in a record time of seven months only due to the diligence, commitment and the long hours that Ramesh Kikkeri and Shilpa put in. Both of them deserved special praise and we felicitated them along with Renu Thakur. Renu is our resource manager who made sure that she filled this building with the spirit and the resources to make it fully functional from the day of the inauguration itself. I was also very happy that Vivek (who is now pursuing his doctoral studies in health economics from Oxford University) and Mamatha were here to quietly share the joy and happiness. Their presence along with all other senior colleagues from the SVYM family made it a special day indeed. The icing on the cake were the special programs that we launched today. Planting of 150 saplings, a training program to build 150 young leaders in Mysore, the ‘Viveka Chethana’ program to make urban youth in impoverished circumstances more employable and relaunching our own ‘Youth for Development’ (Y4D) program were some of them. The energy and spirit of Swami Vivekananda truly pervades our center and it is now up to us to take this forward in realizing his dream of a resurgent and invigorated India.